Happy weekend everyone! I am already doing a horrible job keeping up with the posting schedule I created for this month. LOL. I will try to catch up this week and get back on schedule. I wanted to share the few things I picked up during the month of December. 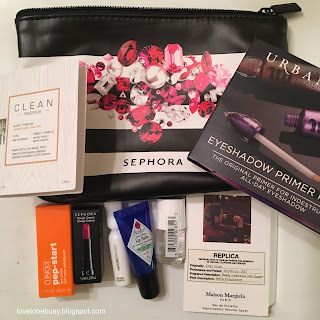 At the beginning of December, Sephora offered a dollar amount of your purchase. I believe I had $20 off of $50 (it was awhile ago so I'm not positive). They were also offering sample bags with purchase. 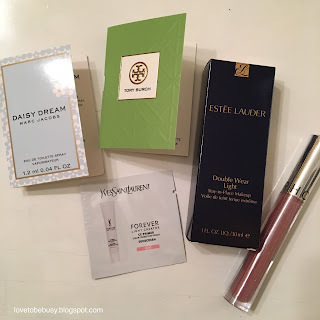 The was down to only one foundation in my collection and had been wanting to try the Estee Lauder Double Wear Light so I decided to pick that up. I am in shade 1.0. I also grabbed the Sephora gloss in Earth and Fire. I really liked the formula of the gloss I received in my Play box awhile back and wanted to try another shade. The other 3 items were the samples I received. 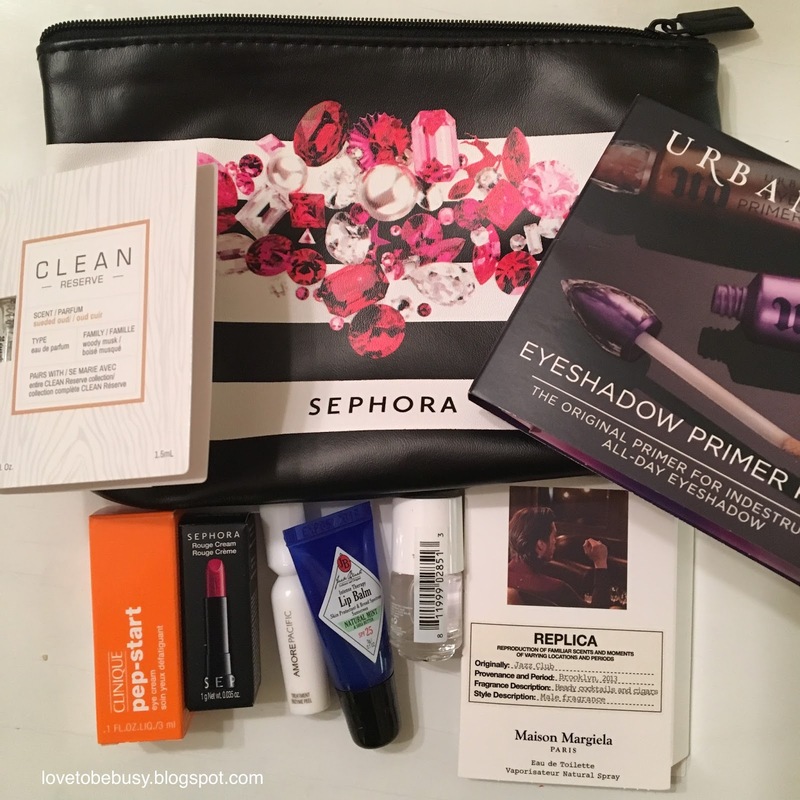 This is the sample bag I chose with the above purchase. I chose this bag for a few reasons. 1. I am using my only daytime eye cream and thought I would try the Pep Start when I finish it. 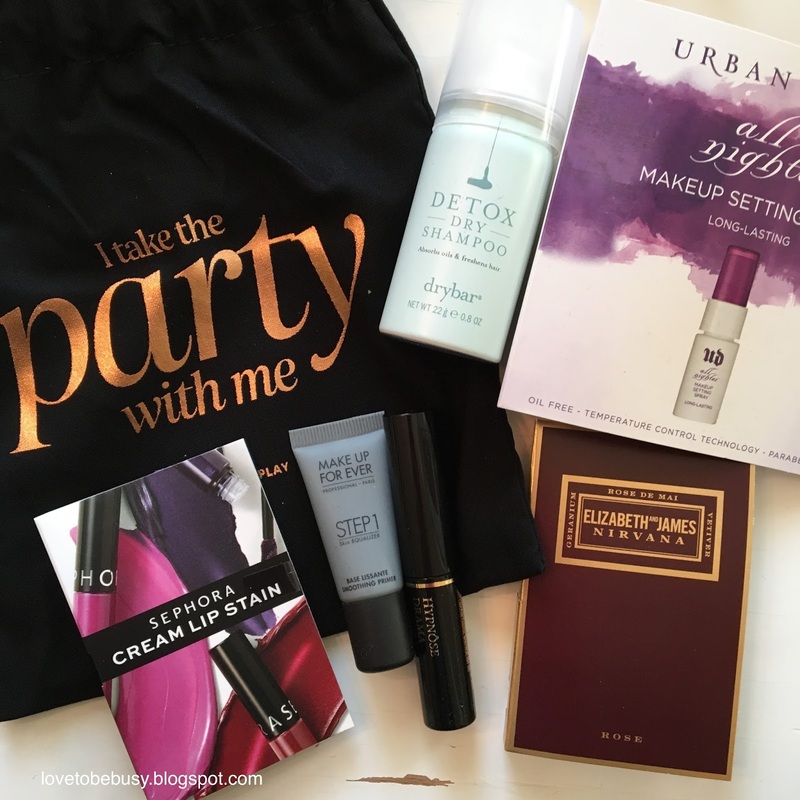 I am using my only eye primer and will need a replacement soon (the Urban Decay one pictured). I also love the Jack Black balm. I have not used most of these items yet so I'll review in the coming months. 1. Sephora lipstain in Always Red - I already passed this along because I don't wear red. As part of my Christmas gift, I subscribed to the Julep box for 6 months. At the time, they also offered a nail polish free gift. 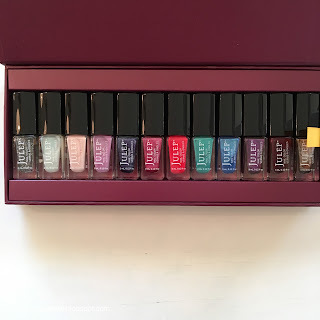 This box of mini Julep polishes arrived (you'll see the boxes starting in January). I've already used the maroon and gold on the right end and love them both. I feel like I did pretty well in December with my purchases. I grabbed a few things I wanted to try, got some good samples, and didn't go crazy with my spending. I hope this is a trend I can continue with in 2017.